SK Hand Tool 80019. Features: Clocking mechanism of six pawls ratchet system ensures that two pawls are fully engaged with ratchet teeth at all times. X-Frame design spreads the workload evenly across the wrench body. Small arc swing enables work in tight spaces. SK X-Frame shape allows for increased breaking power and extends the life of the tool. Unprecedented strength exceeds ANSI specifications by 5 times. SK Hand Tool's 80019 12-Piece 8mm - 19mm X-Frame Ratcheting Wrench Set features the latest technology to make jobs faster and easier. 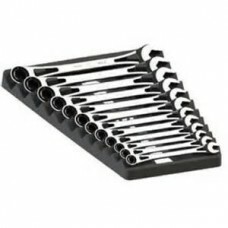 The ratchet system is comprised of six pawls that operate in a clocking mechanism to ensure that two of the pawls are fully engaged with the ratchet teeth at all times. SK's X-Frame design spreads the workload evenly across the wrench body in the same way that an I-beam spreads a load for a bridge or building. 8mm, 9mm, 10mm, 11mm, 12mm, 13mm, 14mm, 15mm, 16mm, 17mm, 18mm, 19mm X-Frame Ratcheting Wrencehs.